Bristol Fashion, Kinkade Kingsdown: Independent is best, and the Kingsdown from Kinkade Guitars proves yet again what a wealth of unsung talent there is in the UK. There’s a healthy number of well-respected small-scale luthiers dotted around the UK. They make superb, hand-built instruments, mainly to order and they really enjoy their craft. Behind Kinkade Guitars is Bristol-based luthier Jonathan Kinkead (pronounced Kinkade) who’s been operating a one-man production line‚ since the mid-70s. Although he’s a bespoke builder, the Kingsdown, a variation on the Martin OM style represents a familiar and standard model around which you can choose custom options in both decoration and woods. Within a range of half a dozen such stock models in the Kinkade catalogue, the Kingsdown has proved most popular and the unembellished, relatively basic version acts as a perfect specimen for dissection. Shipshape and Bristol fashion is more than just a cheap pun; this instrument is pieced together with a rare precision and eye for detail. Both inside and out, all the reference points suggest the builder is a man who truly loves his work. The last time I saw a soundboard bracing so purposefully scalloped and carved, yet totally smooth to the touch, was inside the £5000 plus 25 th Anniversary Lowden (July 1999). In fact the back and side struts are equally buffed. It is claimed this offers less resistance to the vibrating air. Even the keenest, most pedantic inspection could not fault the cleanliness and uniformity of the kerfed linings. A nice touch is the suitably vintage-style, brown paper label inside signed by JK himself. A simple but never plain instrument, there are no fancy adornments for its yellow-hued, solid sitka spruce top, which is rendered from split ( not sawn) sections to ensure straight grain, and thus strength. Maple and black fibre form both edge purfling and the minimal rosette, but these flawlessly laid decorative necessities only grace this top surface neither the seams nor edges of the golden brown, solid Brazilian mahogany back and sides are offered any such frills. Wooden binding is always nice to see and the English holly used here (and for the heel cap) is considerably more classy than celluloid alternatives. But it’s the Indian rosewood scratchplate that strikes a much more individual note on this guitar. The neck is a one-piece construction in Brazilian mahogany, dovetail jointed to the body and sporting a rosewood-veneered headstock. Its unbound Brazilian rosewood fingerboard forms a handsome dark brown runway, divided by a series of fastidiously installed, 2mm wide frets. The open-geared, nickel, Waverley style machineheads are well greased and perform with typical Gotoh precision. Nut and saddle are both bone and fitted with predictable finesse, the latter sitting in a notably meaty Brazilian rosewood bridge and having been carefully carved to compensate for intonation. Although you can get this model in matt lacquer, what you can see from the photos is the painstakingly produced, hand-rubbed oil finish on this particular guitar. While not as protective as polyurethane, polyester or nitrocellulose, its visual and tonal advantages outweigh these shortcomings. The key is in the way the wood is prepared prior to application. After the normal progression from scraper to extremely fine (1200 grade) wet and dry paper, Kinkead moves on to micro-mesh paper invented for polishing Perspex in the aerospace industry ‚Äì which goes up to an incredible 12,000 grade. This produces a mirror-polished surface on the bare wood, normally unnecessary for other finishes. Then several applications of a substance called Tru Oil, normally used in the gun industry, is rubbed in over several days. Finally, after a week of drying, the guitar is buffed to a shine. This attractive, tonally transparent coating is not only time consuming, but conceals no flaws, gaps or blemishes, so it is even more of a credit to Mr Kinkead’s skills that the Kingsdown is so immaculate. 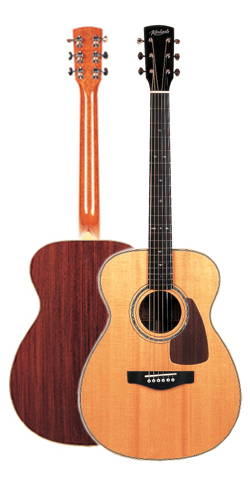 As I mentioned above, the Kingsdown is essentially a variation on a Martin OM body style (although a fraction deeper) and sits snugly on your lap. As far as physical dimensions in the neck department, it’s irrelevant to go into detail about a specific model because the necks width, depth and profile, it’s fingerboard camber, the type of frets and just about any other parameters affecting playability are up to you. Jonathan Kinkead prides himself on his symbiotic relationship with his customers, offering advice on and support for each player’s idiosyncratic needs and requests. For the record, though, this model has a supremely manageable 21- 23mm deep, C-profile neck; 44mm wide at the nut, 55mm at the body with a compound 10-12 inch radius camber on the fingerboard. The key elements of the set-up – string height, neck alignment, neck relief and saddle height have been dealt with masterfully to give effortless clarity. The natural, buttery sensation provided by the oil finish is a pleasure to slide against, leaving both gloss and particularly matt finishes, seeming cold and synthetic with considerable less potential for improvement with age. The gleaming frets with burr-less edges and the fingerboard suave rosewood tract do nothing but enhance the experience. What else can I say? It’s nice .. very nice. The Kingsdown has a tone with a clearly defined purpose, and that’s undoubtedly as a solo instrument. It would be such a shame to swamp its elegant sonic beauty with any other sound. This is the antithesis of the dreadnought tone; terms like “thick” and “chunky” are replaced with “delicate” and “chiming”. That’s not to say the full voice of frequencies is not represented, it’s more to do with the management and balance of the sound. Most impressively, its eloquence is not simply achieved by a modest bass response and bright treble, there’s an intimate mellow presence here that Kinkade has translated more meaningfully than most from the dialects of spruce and mahogany. It’s not a loud, punchy output, that impresses immediately but bores just as quickly. Instead the Kingsdown tone seeps persuasively into your soul, bypassing the normal channels. I’m sure the oil finishes sympathetic lightness is a major factor in this fluent communication. Surprisingly impressive for a small body when approached with a plectrum, it responds with an earthy edge, but for the full angelic chorus you need to tickle the strings with your fingers. Like all fine acoustics, the Kingsdown adds that all-important X-factor to everything you play, making even the simplest pieces sound considerably more involved. If you’re looking for an outstanding new acoustic for aroun £1000, then the Buyer’s Guide at the back of the mag is a great place to start. But you’ll be hard pushed to find an acoustic anywhere near as special as this one for the price. Even the unparalleled value we get on Lakewood wouldn’t turn my head from this little charmer, and probably only Fylde or Brook could match its authentic hand-built character for this money. Of course, any custom options you desire will bump the price up, but you know every penny spent is entirely devoted to your dream guitar. Also bear in mind the cost of the essential Hiscox case is not included. If you’re a patient person who knows exactly what you want from a guitar and you know the perfect model does not exist in the shops, because it’s still in the conceptual stage in your head, then a small-scale builder like Kinkade Guitars is where you go. If you ignore my original advice above and go straight to the classified ads in the back, you’ll see a few ads for independent luthiers. You may have to wait a little while, but with an attitude towards his customers that is to ensure that the finished product surpasses expectations, and given the quality of this model, Jonathan Kinkead could be your man. WE LIKED: Construction, unique finish, playability, tone and the price.